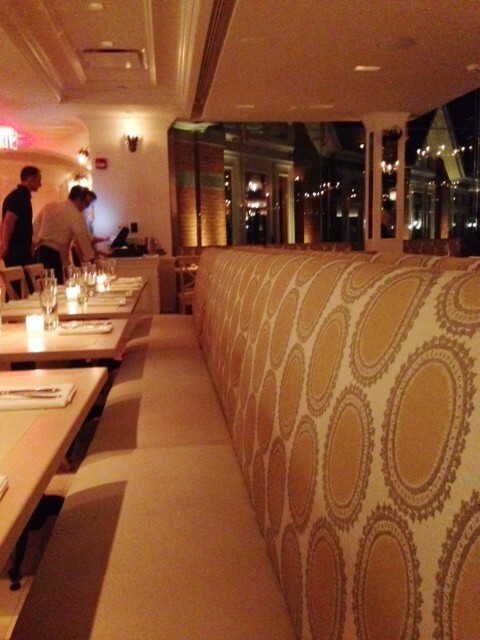 As a die hard New Yorker (aka I never lived elsewhere), I was SO pumped for the return of Tavern on the Green. A classic New York institution, this restaurant sits on 67th and Central Park West, with horse drawn buggies outside, and despite the amount of greenery out front, it emits a gentle glow of lights that you can see from the street. So pretty. Oh and PS: a man with a top hat will open the front door for you, so just make sure you are dressed nicely and put on your classy pants. For guys, jeans are fine, as long as you dress it up with a button down and good shoes. The inside of Tavern on the Green is gorgeous – they did a great job with renovations, while still keeping that “old New York” feel, especially in the dark wood bar. I loved it. 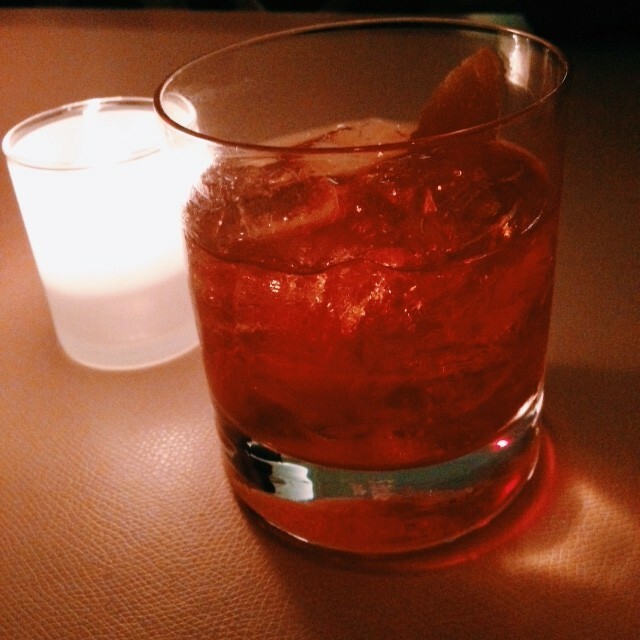 Naturally, I got an old fashioned to celebrate. We started with the trio of ceviches, and the fried duck egg on top of ricotta crostata with anchovies and olives. 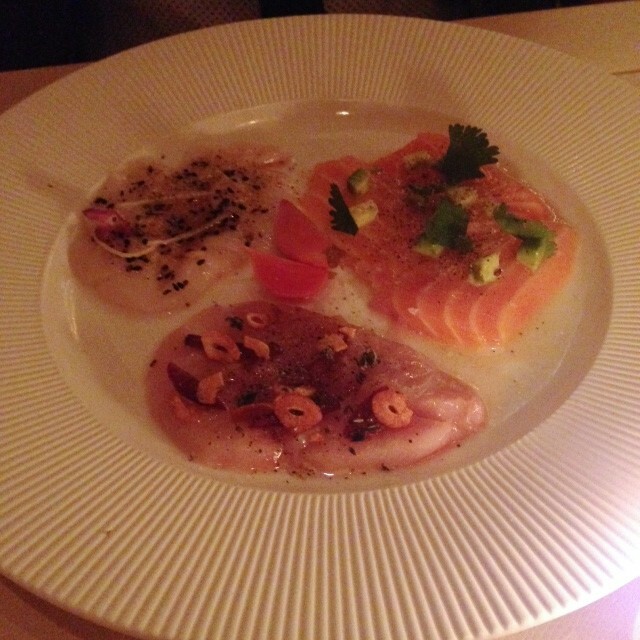 The trio of ceviches was delicious, and each one was between $14-$18, or you could get all three for $24. That seems like a no-brainer to me. There was Faroe Island salmon with avocado, cilantro, and blistered serrano chili peppers, Spanish mackerel with toasted garlic and pickled red onion, and lastly, Black sea bass with ginger, lime and black sesame sea salt. In order of favorites: Mackerel (mostly due to toasted garlic), sea bass (that SALT doe), and then the salmon (too much cilantro for me). Pretty to look at too.. but better to eat. 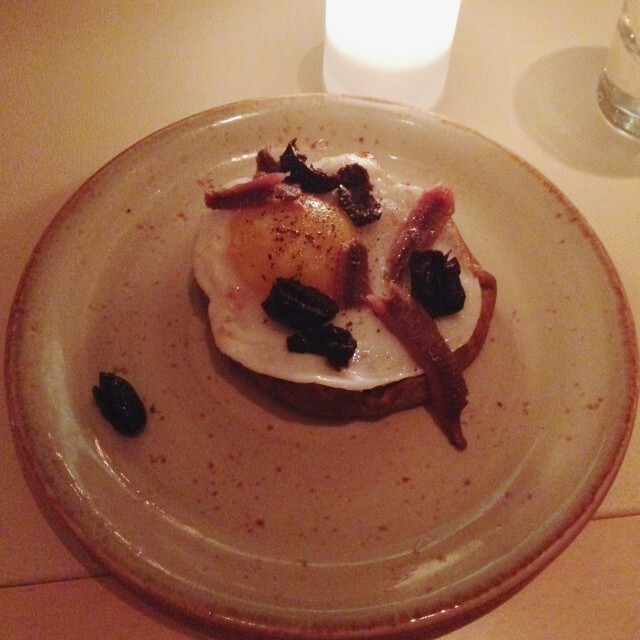 When you see fried duck egg on a menu, YOU GET THE FRIED DUCK EGG. Their version sits atop a ricotta crostata, with olives and anchovies. I know those last two are not always popular, but I love anchovies and olives, so for me this was literally a perfect dish. Texturally, and then the silky egg yolk, finished off with the super salty bite from the anchovies. Damn. Straight heaven. The menu at Tavern on the Green is actually quite large, and it’s split up into a few sections: the Plancha, The Grill, and The Hearth. We got two entrees, one from the Plancha, and one from the Grill, as well as a side of creamed chards. Those were delicious too but needed a little sprinkle of salt. Fortunately they give you little sea salt flakes with a teeny tiny spoon and it’s so fun to do! I love things in cute, small packages. 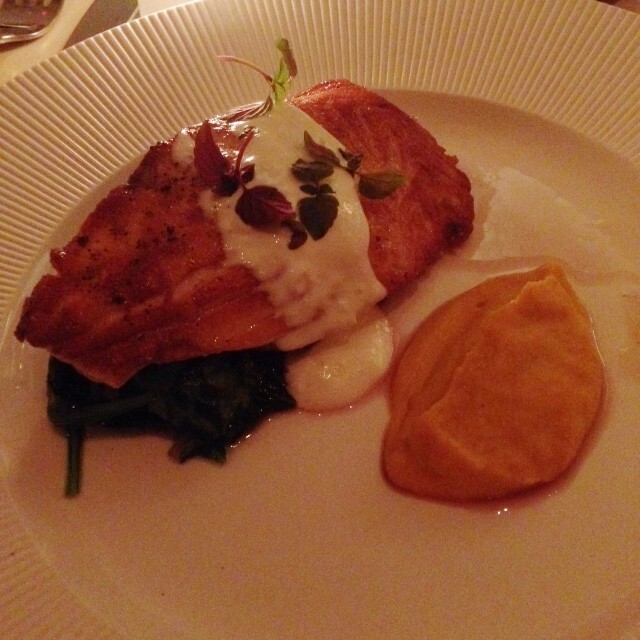 The Plancha Entree: Faroe Island salmon with sauteed greens, cumin-roasted carrot puree, and horseradish creme fraiche. Umm. Delicious. The salmon was cooked perfectly, but I could have used more horseradish creme fraiche. Frankly I could bottle that and take it home. This pic doesn’t do it justice. 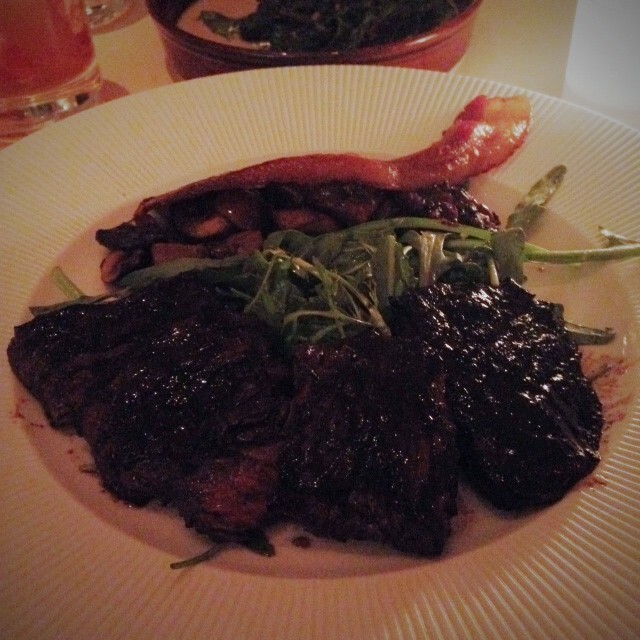 The Grill Entree: Marinated skirt steak with red onion marmalade, chanterelle mushroom, bacon and wilted watercress. Here’s another thing I’d like to bottle: red onion marmalade. The steak had such a nice char on it, but when you add the sweet onions and salty bacon on top..aggressively delicious new level. And I was totally ok with it.